Conference notes that Access To Work funding is a vital tool in enabling disabled people gain employment and stay in work. This fund allows employees to defray additional employment costs that arise as a result of their disability. These include, but are not limited to, services such as British Sign Language (BSL) interpreters, specialist adaptations to your workplace, specialist equipment or the costs of taxis in order to get to work. From October 1st 2015, awards made to people will be capped to £40,800 per annum. Prior to this date, awards were made dependant to the person’s needs. This will put people in a difficult position when trying to stay in work. This may include not being able to continue to work with an interpreter who you have developed a relationship with or risk working with someone who is homophobic, biphobic or transphobic. In 2014, the Papworth Trust conducted research that showed that the pay gap between disabled and non-disabled people has widened by a third since 2010 and that disabled people are much more likely to live in poverty that non disabled people. Lesbian, gay, bisexual and transgender (LGBT) disabled people face increased barriers to obtaining and keeping employment. Even people who qualify for an Access To Work grant find that the support can be lacking. Anecdotally, when people face problems with adapted workstations, they are told that their employers would need to meet the costs of maintaining those workstations and this could lead to a break down in working relationships. 2. Publicise the cuts in Access To Work and work with appropriate bodies to ensure the rights of disabled LGBT people are not cut further. 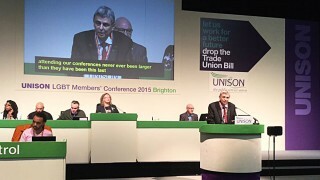 The national conference of UNISON’s lesbian, gay, bisexual and transgender members self-organised group.